1. 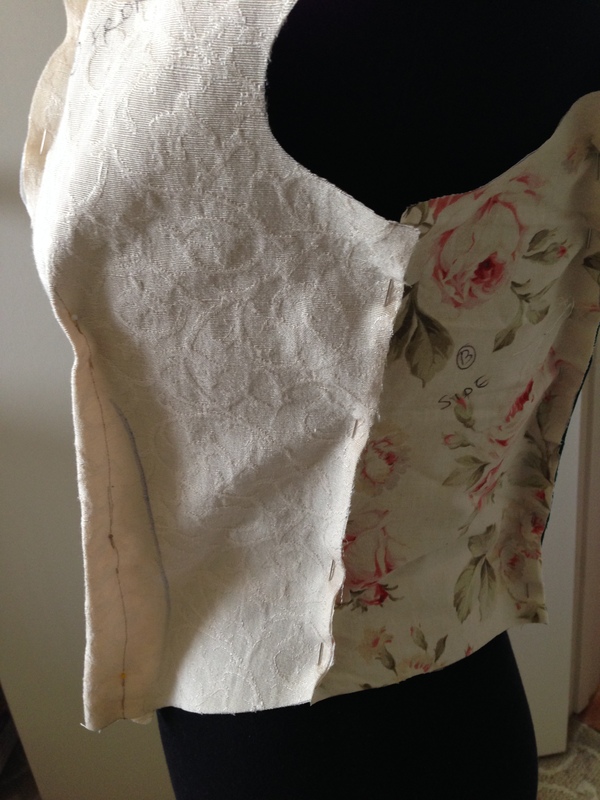 Made a pre-mock up and mock-up: Generally, I use the mock-up to line the finished bodice, but since I am working this time with a shape new to me, I opted for a “rough draft” using scrap fabric to get a general idea about the sizing. 2. 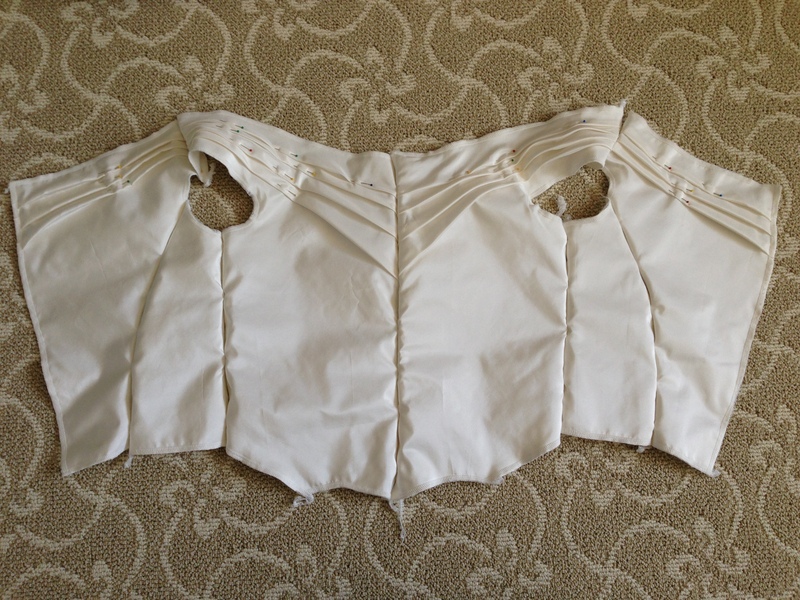 Cut out the silk fabric and linen lining, pinned down the gathers, and serged the pieces together. 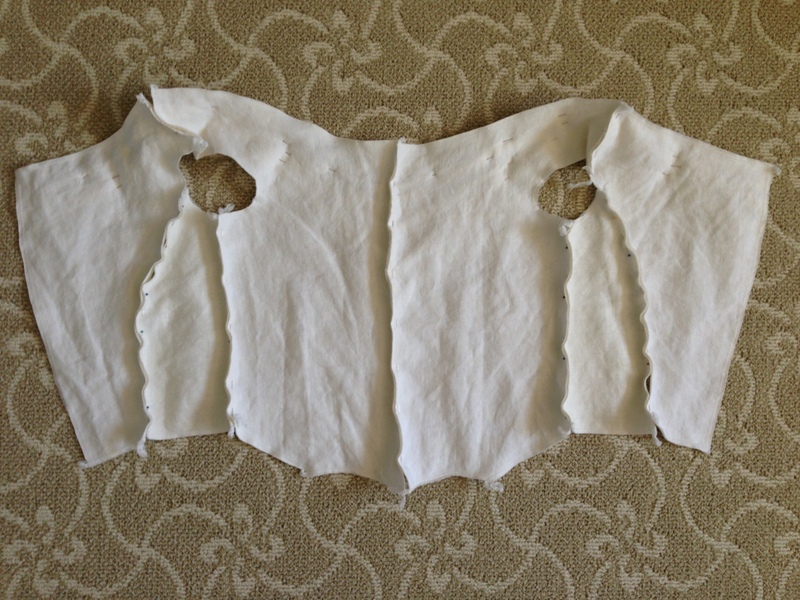 The TV455 pattern directions call for a fashion fabric, interlining and lining, but I am afraid it will be too bulky to have so many layers. 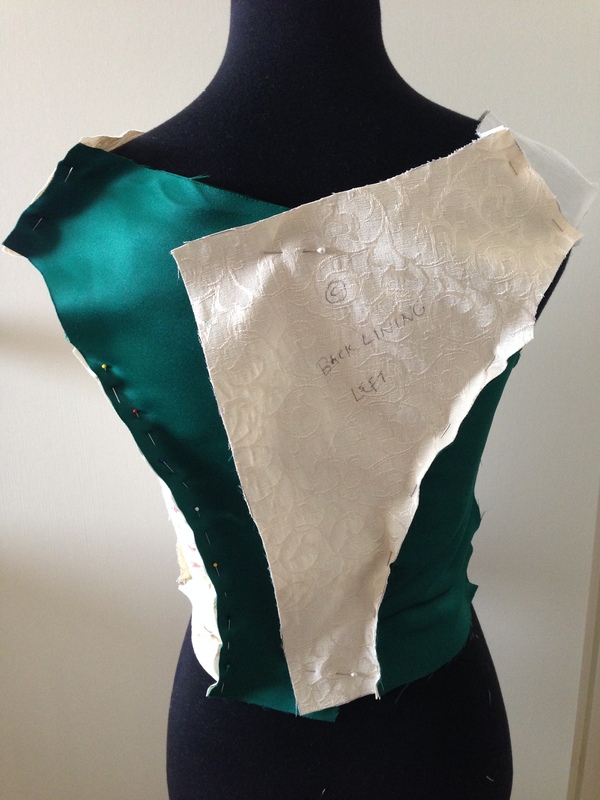 Plus, If I flat-line and serge all the edges I can alter the bodice more easily should I need to. All pieces, minus the sleeves. 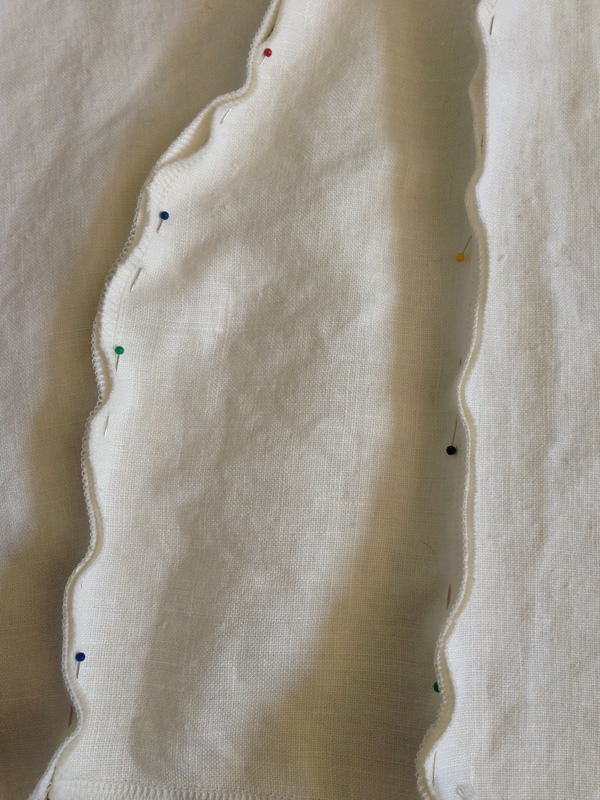 A close-up of the linen interior and serged edges. Some comments about the sizing: The TV455 pattern runs large! 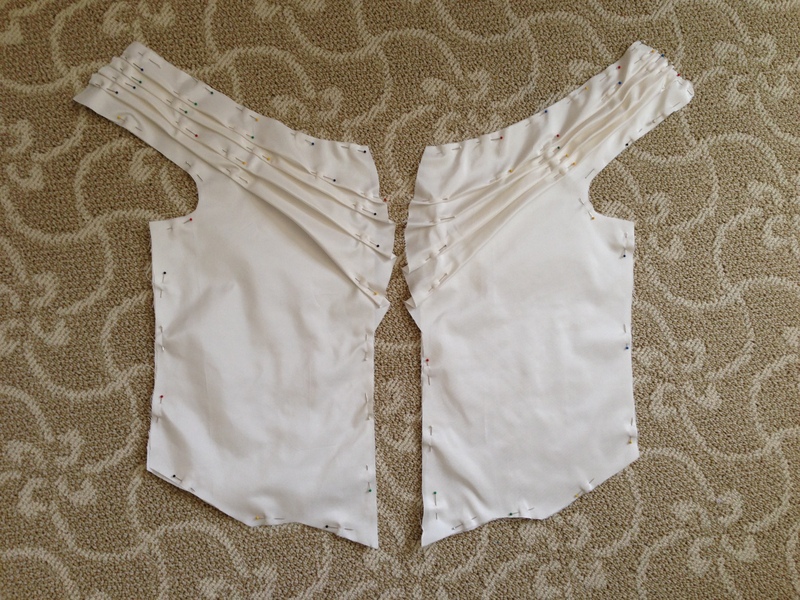 According to the pattern, I am a size C, but I found when making the pre-mock-up that the pieces are sized rather generously. I decided that either a size B with the darts taken in a lot, or even a size A with small darts, would fit better. You can see there is a lot of extra fabric. There is significant overlap in the back. (Some archaeological comments to myself about the scraps: The green satin is from a 2006 Dickens Fair dress, and the floral cotton is from a spring jumperskirt worn to a friend’s wedding in 2009. Both dresses have since been sold).